Indian & Persian Cuisines uses their own specialised couriers to deliver their food. Onions with fresh spices deep fried in pea flour batter. Homemade pastry with spicy vegetables or meat filling. Grilled meat patties with garlic and fresh spices. Spicy crumbed prawns rolled in garlic. Creamy yoghurt and wild garlic. Creamy yoghurt, cucumber and mint. Persian favorite grilled minced lamb kebab and grilled tomato. Marinated boneless chicken, saffron, grilled to perfection and grilled tomato. Lamb shank with green rice (mixture of rice, dill, herbs & Persian spices). 2 skewers of grilled koobideh (minced lamb) or 2 skewers of grilled joojeh (boneless chicken) or mix both and 2 noon (flat bread) & a skewer of grilled tomato. Our tandoori dishes are marinated in yoghurt with fresh hobs & spices, creating tastes of timeless traditions. Marinated diced chicken breast fillet. Breast fillet in mango sauce. Tandoori chicken breast fillet in a tomato and cream sauce. Flavoursome beef curry combined with pan fried spinach. 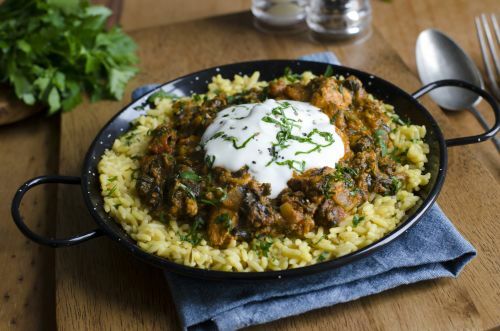 Tasty lamb curry simmered in a lentil sauce and a touch of lemon. The perfect balance of herbs and spices complement the myriad of vegetables used in our curries. Combination of fresh seasonal vegetables. Baked and pan-fried with ginger and garlic. Homemade cheese, cream and pureed tomatoes. A nutritious thick lentil soup. Lamb chunks, sauteed herbs, red kidney beans and dried herbs and saffron rice. Lamb chunk, tomato sauce, split peps, dried lime and Persian spices with chips and saffron rice. Chicken, pomegranate paste, walnuts and Persian spices and saffron rice. Free rice with every curry orders. Served with chips and fried chicken. Bread baked in the tandoori. Filled with cashews, chives, sultanas, coconut. Filled with spinach and cottage cheese.